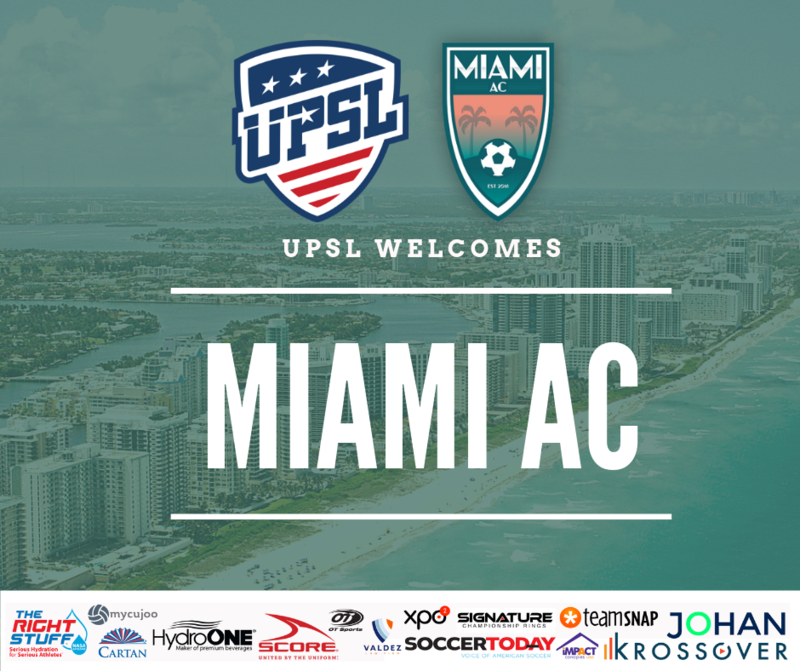 February 6, 2019 – Los Angeles – The United Premier Soccer League (UPSL) is pleased to announce Miami Atletico Club as a new league member kickoff off with the 2019 Spring Season. Based in the Magic City, Miami Atletico Club will begin UPSL play in the Southeast Conference Florida South Division, and is finalizing its home facility in compliance with UPSL's Minimum Standards. United Premier Soccer League Southeast Conference Florida Division Manager Christian Vallejos said, "We're excited to welcome Miami Atletico Club to the Florida South Division. Owner Phil Zayas is well known in South Florida for helping develop and advance players, and it will be exciting to see his teams perform on the field. We wish Miami AC success as it prepares for its first UPSL season." Phil Zayas is General Manager of Miami Atletico Club. A native of South Florida, Zayas, 42, enters his ninth year as Head Coach of the Men's Soccer team at Miami's Johnson & Wales University (NAIA). He also serves as a South Florida scout for U.S. Soccer's Youth National Teams. Miami Atletico Club General Manager Phil Zayas said, "I like what I've seen with the growth of the UPSL. I think it's been great to see that it's been performing as a national league and it's still growing. It's stepping up the level of professionalism for the game and it's a league I'm proud to be a part of today." Miami Atletico Club will soon announce its home site for UPSL home games, Zayas said. "Miami is the gateway to South America and the Caribbean and this is the world's game so that makes Miami a melting pot of soccer. Everyone loves the games and there's an abundance of soccer players and not enough professionally-run organizations to help move players on to the next level, and so the plan with Miami AC is to use the team as a platform to move players to the next level." Zayas said. The club will announce tryout dates and its upcoming UPSL game schedule. Miami Atletico is an American Soccer club currently based in Miami, Fla., and a new member of the United Premier Soccer League. Miami Atletico Club will play in the UPSL Southeast Conference. Founded in 2018, Miami Atletico Club can participate in the qualifying rounds for the Lamar Hunt U.S. Open Cup through their affiliation and membership with the UPSL, the U.S. Soccer Federation (USSF) and the United States Adult Soccer Association (USASA). The UPSL was formed in 2011 and currently includes more than 300 teams in Alaska, Arizona, California, Colorado, Florida, Georgia, Idaho, Illinois, Indiana, Iowa, Kansas, Massachusetts, Michigan, Minnesota, Missouri, Nebraska, Nevada, New Hampshire, New Jersey, New Mexico, New York, North Carolina, Ohio, Oklahoma, Oregon, Pennsylvania, Rhode Island, South Carolina, Texas, Utah, Virginia and Wisconsin. UPSL is the fastest growing Pro Development League in the USA, with 400-plus teams targeted for 2019 Fall Season. Each UPSL team is individually owned and operated, and is responsible for maintaining either UPSL Pro Premier Division or Championship Division minimum standards.